This week’s goal was to get to the major increases on my dolman sleeve cardigan. The only impediment I had to reaching my goal was the weather. It was absolute stinker of a week in Melbourne, with hot days, hot nights, crowded trains and general (in my mind, justified) moaning about the weather. Knitting in this weather wasn’t fun, and I did question my sanity many times, but I plugged along and juuuuust made it to the major increases yesterday. The upside to spending a lot of time working on the cardigan is now I really know the pattern. I’d mentioned before that it was a fairly easy pattern to remember, but it turns out I was lying a little bit. I found the basic structure easy to remember, but there are two mirrored twisted stitches close to one another that I had a lot of trouble committing to memory. I’m still occasionally having to rework the twists, but a lot less often than I was earlier in the week. 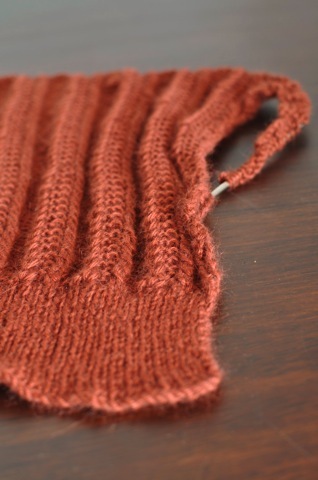 Now I can start to see the sleeves coming along on the cardigan, I want to keep going. So, next week’s non-binding, no consequences goal is to finish the sleeves. That does mean working on 224 stitch rows, but it’s at least going to be a lot cooler this week. Small mercies and all that. oh, like you – I could have wept (and possibly did!) at that first cool breeze heralding the change!! So, did you get lots of weird looks? Or were you too busy knitting to notice?